The holy youth Martyr Gabriel was born in 1684 in the village of Zverka, Zabludov diocese, to a pious peasant couple, Peter and Anastasia Govdel. 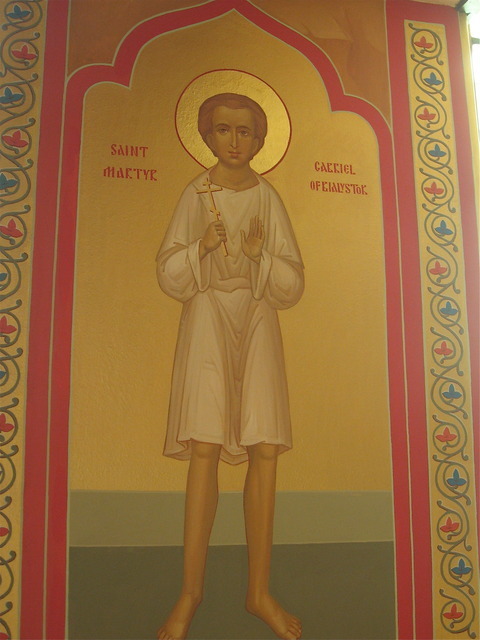 He was baptized in the Dormition church of the Zabludov monastery and received the name Gabriel in honor of the Archangel. Besides the meekness and guilelessness normally found in children, the young Gabriel was marked by characteristics uncommon to his age. He had, for example, a reflective nature and a mature perception of the action of Divine Providence in people's lives. It is not surprising that he inclined more towards prayer and solitude than towards the amusements which occupied his peers. In 1690 tragedy visited the GovdeI family. One day the unsuspecting mother, leaving the six-year old Gabriel alone in the house, took some food to his father who was out plowing the fields. While she was gone a local tenant came to the house. Taking advantage of the parents' absence and the child's trusting nature, he kidnapped the boy. 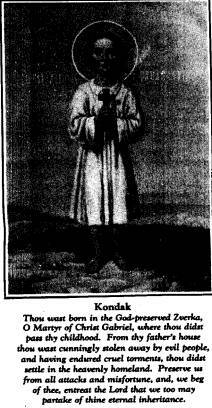 Gabriel was taken secretly to the town of Bialystok and given over to sadistic torture. His side was pierced and a special instrument was inserted which gradually drained his blood. After nine days of such treatment the boy died. Desiring to conceal such a vile deed, the murderer secretly took the body and threw it onto the edge of a field near some woods in the vicinity of the boy's home village. The holy Feast of Pascha approached. Hungry dogs began gathering around the lifeless body, predatory birds circled overhead. Miraculously the body remained untouched. Not only did the dogs refrain from devouring it, they even guarded it against the birds. The body of the young martyr was eventually discovered and taken to Zabludov. An investigation brought to light the particulars of the crime which was duly entered in the town records. With the participation of many local inhabitants, deeply shaken by the committed atrocity, the body of the martyr Gabriel was laid to rest near the cemetery church. There it remained for close to thirty years. Once, during a burial, some grave diggers inadvertently came up against Gabriel' s coffin. When it was opened witnesses were astonished to see that after the passage of so many years, the child's body was incorrupt. News of the miracle spread with lightening speed among the faithful, strengthening and increasing veneration for the holy child. His relics were reverently transferred to the village church in Zverkov and placed in a special crypt below the church. In 1794 a fire destroyed the church but, miraculously, the relics were spared. 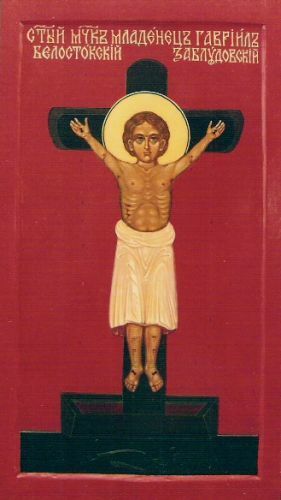 Only a portion of one hand was partially burned and this, undoubtedly, in accordance with God's Providence for the sake of strengthening faith and piety among the Orthodox people, for when the holy relics were subsequently transferred to the Zabludov monastery, the injured hand was supernaturally restored; it was found to be newly covered with skin. 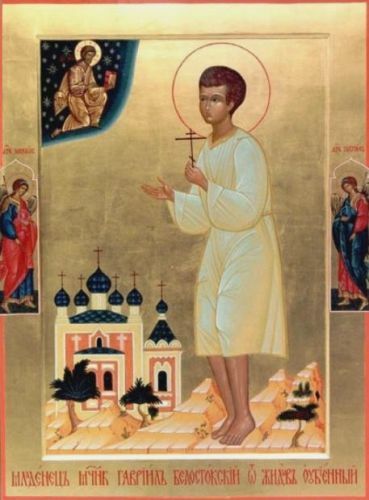 The living memory of the child-martyr, the honor accorded him, and the desire to promote his veneration inspired the building of a church on the site of his grave. On the day of Holy Pascha 1894, took place the festive consecration of the church. Sadly, only eight years later this church also burned. But on this occasion likewise there occurred a miracle. 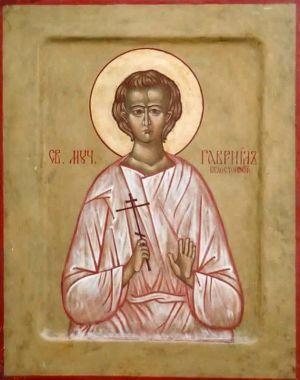 Although the church was completely destroyed, the icon of its heavenly patron, child-martyr Gabriel, was preserved unharmed. For many years St. Gabriel's relics lay in the Zabludov monastery. External circumstances, however, forced upon the area a tense situation which was heightened by the ill will of some of its heterodox inhabitants. For the sake of security the relics were transferred to the Holy Trinity Monastery in Slutsky--which explains how St. Gabriel came to be called "Slutsky," a fact which clouds the true origin of this Zabludov saint. 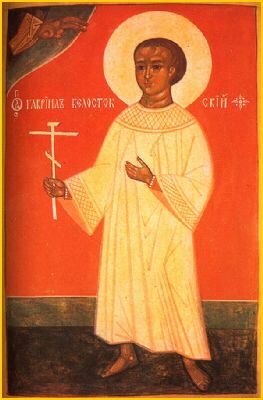 From Slutsky the holy relics were eventually transferred to the city of Minsk and then to Grodno where they remained until their solemn return in 1992 to Bialystok, the Martyr's homeland. Archbishop Savva of Bialystok and Gdansk called the celebration "a second Pascha." And indeed, those who participated in the translation of the relics of Child Martyr Gabriel from Grodno to Bialystok on the memorable days of September 21-23  would agree.